This pretty Victorian Lodge house has recently been totally refurbished making it an ideal luxurious relaxing getaway. 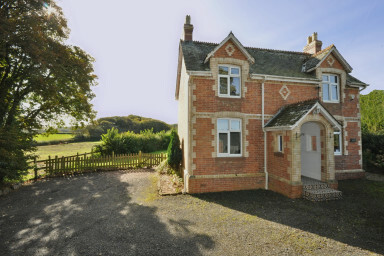 High Park Lodge was built in the early 1900's and is a detached 2 bedroom house situated in the heart of North Devon. It offers easy access to beaches, moors, coastal path walks, cycle paths, golf courses, horticultural gardens, children friendly fun parks, and many other traditional outdoor and indoor recreational activities for those seeking a truly relaxing, yet active, break away from the stresses of day-to-day life. The house is situated with 14 acres of private land with secure access via electric gates. Within the grounds is an accessible large natural lake featuring stunning vegetation, over 200 fish and a boat house. The house was refurbished and modernised in April 2014. The downstairs has separate lounge, dining room, traditional oak top kitchen & family bathroom. The upstairs has a master bedroom with super king bed (2mx1.8m) and second bedroom with 2 single beds. The property is furnished with solid oak furniture, carpet throughout, leather sofas and recessed LED lighting.